Philippe Chow, the upscale Beijing-style restaurant, now has a second location in the Meatpacking District at the Dream Hotel. Philippe Downtown will offer Chef Chow's modern take on traditional Chinese cuisine. Philippe is known for attracting celebrity guests from Cardi B to Justin Bieber and Jay-Z. The restaurant will cater to a dinner and late night crowd with favorites like Chicken Satay, Salt and Pepper Lobster, Mr. Cheng's hand-pulled noodles and Peking Duck carved table side. For dessert, there is Cotton Candy Baked Alaska and 11-Layer Birthday Cake. 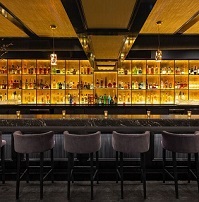 The subterranean space was designed by Corbin Plays, known for his work at the Ludlow, Maritime and Bowery Hotels. It features bold red accents, symbolizing good fortune in Chinese culture, along with gold fixtures, upholstered banquettes and a gold leafed ceiling. Philippe Downtown also a full bar and DJ Booth.